There is a time to devote the part that a man wants to take by himself, learn it and foster the width, the depth and the volume of the knowledge. And I think that the time may be divided into two times of the time to present the capacity learnt and fostered by the person himself and the time to show it as his own thing. Now, how much do I have come to the completion of my life? Is this time the process making learning fat and fostering the volume? Or is this time the process polishing and presenting in order to show what I have learnt? 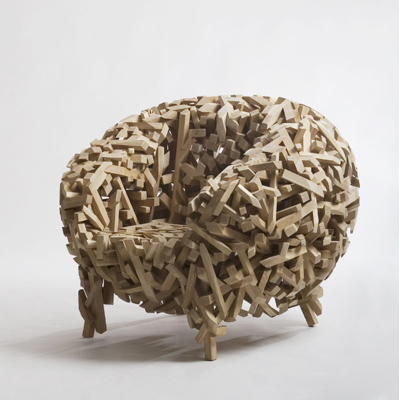 Crossed stick chair was progressed in order to express the series of these processes to a work. At the beginning, I had attached the sticks with various sizes one by one without knowing what I have to make. I drew a chair when a size was made to some extent and I had attached sticks in order to make the shape that I want. More and more this part…. When the chair was made to some extent as the size that I want to accomplish, I started cutting as the shape of the use that I want and polishing it. Even cutting and grinding…. I would like to express it.